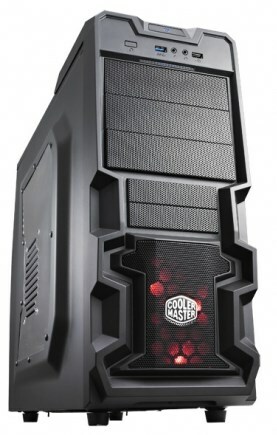 Cooler Master also introduces the K380, a new entry-level steel mid-tower case with an all-black finish. The K380 measure 209mm x 445mm x 479mm, it weighs only 4.7kg and although it has a somewhat weird design, the features are quite good for its price level. 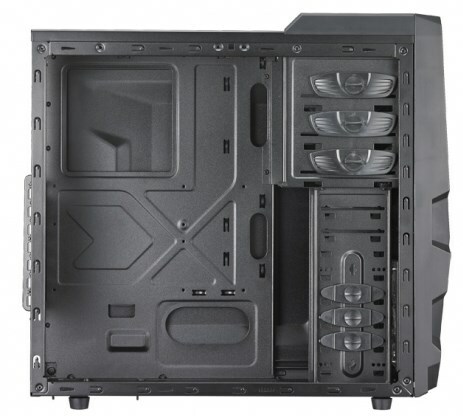 The case supports Micro-ATX and ATX motherboards, there are three exposed 5.25" drive bays, two exposed 3.5" bays, five 3.5" storage bays, three 2.5" storage bays, and seven expansion slots. The case has a side-window and features a front I/O panel with one USB 3.0 port, one USB 2.0 port, and HD Audio ports. Cooling is provided by one included 120mm red LED intake fan, and there's room for up to three more 120mm fans. The maximum VGA card length is 316.6mm (with HDD cage removed) and the maximum CPU cooler height is 155mm. The K380 also features cut-outs for cable management and watercooling tubes and comes with dust filters at the bottom. The 5.25" drive bays are tool-free but not all of the 3.5" bays are tool-free. A quick price comparison search reveals the K380 is currently shipping in Europe for around 41EUR. K380 is an entry level mid-tower with a rugged look and full matte black finish. Up to four fans can be installed. One 120mm red LED fan located behind the front panel is included and offers optimized cooling. A fan can be mounted on the windowed side panel to keep graphics cards cool. Large high-end graphics cards, like the NVIDIA GTX690 and AMD HD 7990, are supported thanks to K380's spacious interior. It comes with three tool-less 5.25" bays and space for seven HDDs (three tool-less) to increase expandability. An USB 3.0 port lets you charge and access data on smart phones and tablets much faster than USB 2.0.